Tim Jones graduated from Wooster High School in 1976 where he had excelled in both football and baseball. As a quarterback, he stated for the Generals for three years. He was a natural with a strong arm and good leadership abilities. Jones was selected to the All Cardinal Conference tam all three years and was named Most Valuable Player in both his junior and senior years and was chosen MVP for several games as well. Jones also was the starting catcher for the Generals’ baseball team for three years. He led the team in batting all three years and set several school records on the diamond which still stand. One of these is most notably the .580 batting average he carried in his senior year. He was selected to the All Cardinal Conference team all three years and again was Conference Most Valuable Player in his senior year. At the end of his senior year, 1976, he was selected as the senior Athlete of the Year for the Generals. 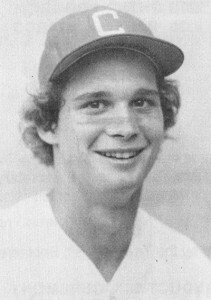 Also in 1976, Hones was drafted by the Los Angeles Dodgers baseball club. He spent four years in this organization, playing with four different team in the outfield. Each change of team was an advancement, but he never made it to the parent club. Jones played on several area softball teams where he again starred as a player. He currently is in the Heating, Ventilating, and Air Conditioning business in North Carolina. Timothy Jones has been a winner all of his life and a Champion at various level of sports. He has previously been inducted into the Wooster High School Sports Hall of Fame.